I confess it, I'm a Russophile, loving much of Russia's literature, music, dance, and culture. Russian folklorist Aleksandr Afanas'ev (also transliterated Alexander Afanasev) is the main source of much of Russian folktales. As with my earlier posting of an Andersen tale, I strongly urge having as many versions of these tales as possible. 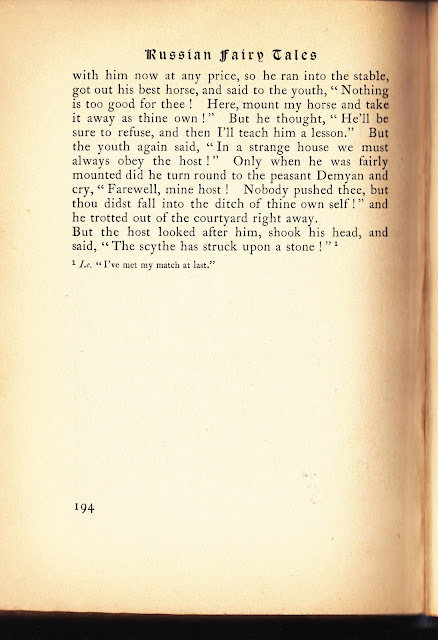 My favorite re-tellings are in Arthur Ransome's Old Peter's Russian Tales. Later I plan to post my two favorite tales from his work. Today's "The Tale of Peasant Demyan" avoids those stories. It's short, useful, but little known. I hope you enjoy this trickster outwitting a bully at his game. 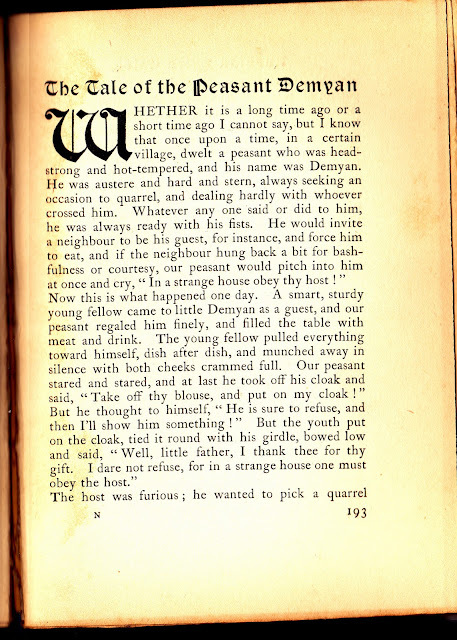 As with many older stories slight wording changes, for things like the "thy" and "thine"s, would be helpful in telling. Possibly you might prefer to explain before telling the story what the traditional Russian blouse was and that it was a masculine shirt unlike the usual blouse which is feminine. Personally on the final sentence I would insert "the traditional Russian proverb" before saying "The scythe has struck upon a stone!" I would then add, "Which means 'I've met my match at last.' 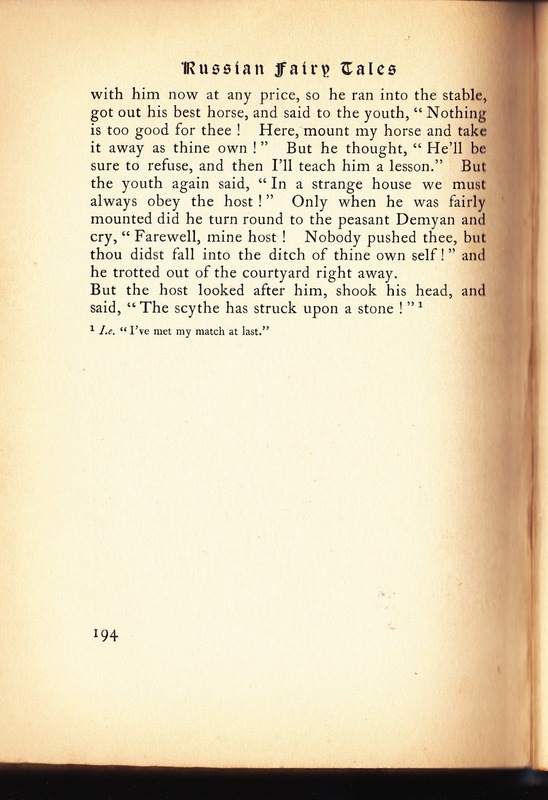 "
This came from R. Nisbet Bain's Russian Fairy Tales; from the Russian of Polevoi. Russian historian, Peter Nikolaevich Polevoi, published in Russian some of Afanas'ev's tales and Bain translated stories that had been missed in an earlier book by W.R.S. Ralston. Similarly today's tale isn't well-known, but should be. According to what I see online, this book by Bain currently only seems to be offered in selections from it rather than the complete volume. Some of my Russian folktale books, including the Pantheon edition, according to copyright searches, weren't renewed, but I'm only posting from titles safely published before 1923. I'd hate to accidentally run afoul of the "copyright police." While selecting this, I went to the Wikipedia article on Robert Nisbet Bain and found he was fascinating, too. I must add more of both his Russian and Turkish translations to my library! Next time we'll have a story from one of the few books of Greek mythology that I own. It's mythology with an emphasis on being a story.